Mr Curran ran the INTA National Instructors course in a separate room for those black belts that didn't attend this yet; this part of the course explains all the ITF's rules of conduct, and how to open a new INTA club. Those thinking of grading to 1st degree black belt in December were given the opportunity to show their knowledge in front of Master Douglas and Master Martin, and received individual feedback afterwards. At the end of the first day, there was a lovely presentation by the clubs from County Cork to commemorate Grand Master O'Toole's recent promotion. After a fitful rest there was an early start on Sunday for all the red and black belts. After a decent warm-up, black belts over 3rd degree continued their patterns. The remaining students were taught how to use power in movements, which then increased in difficulty. 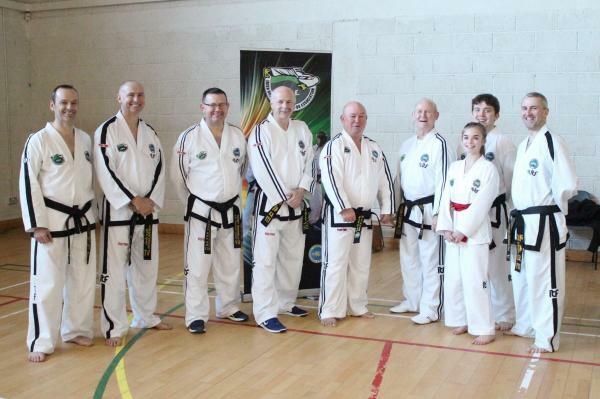 Those putting themself forward for the December Black Belt grading for 2nd Dan and above were given a short mock-grading, and received feedback from Grand Master O'Toole and Master Douglas afterwards. Meanwhile, all other students practiced their one-step routine, and were asked to show their best moves in front of all. We would like to thank Grand Master O'Toole, Master Douglas, Master Martin and Master Donnelly for their time and their dedication to furthering our knowledge of Taekwon-Do. Many thanks as well to Mr Stobie, Mr Tony Mac Donagh and Mrs Maggs Mac Donagh for organising this ITC.